Although it is a tragic waste of a half-decent lager, there is something altogether lovely about a bottle of Star accidentally left in the freezer compartment overnight. The way the frost clings to the bottle and then slowly recedes. The bright green hue of the slushy liquid behind the thawing glass. Above all, the sense of anticipation, frozen to nothing. I sometimes imagine a Belgiumification of Nigeria, where instead of the paltry triumvirate of available beers, a host of microbreweries emerge, doing interesting things with sorghum, cassava and apples. In the same way, I also imagine an arabica colonisation of the land, with Nigerian Green Mountain (Gangirwal, anyone?) being the talk of coffee houses from Melville to Fort Greene. The soil and the climate here is good: what has Jamaica got that is better? ... Jamaica has; the volcanic soil of the Blue mountain, lovely beaches, a smaller population, an entrenched democracy, adherence to the rule of law and doesn't suffer from the distraction of a single resource feeding an overbloated elite. thats actually what Jeremy was saying Giles...if you know him at all/have been reading his blog for a bit. Jeremy // no real reason why the microbrew option should not play out in obodo Naija. It would be an interesting experiment as long as acceptable slice of the population is targeted and the "specialty" beer is designed to accommodate regional tastes. May even play out as an export to some West African destinations. 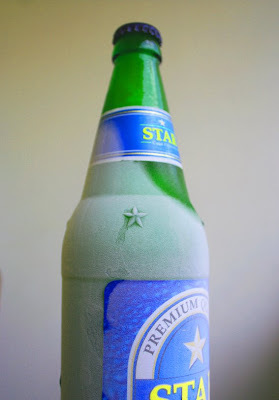 Beers that would be appreciated over the whole populace would probably tend to be as bland as Star / Gulder. You could be on to a good thing there.. Cool picture, by the way..
Belgiumification of Nigeria? Rather not, thanks very much. The Belgian stuff is overrated. as is their technique. To "anon" who believes belgian brews are over rated..
Not sure how you judge your beers but would be glad to learn. Finest beer I ever tasted is a belgian beer but that was probably due to the circumstance and is another story. Suffice to say that the only US beers I have found worth drinking are products of microbreweries (Dogfish head and Sam Adams varietals to name the finest and most popular). You can even indulge yourself by selecting beers to complement your meals quite easily now. Would be tough but not impossible to create a niche market for this kind of product in Naija. There are several successful microbrews in South Africa I have enjoyed but the middle class AND tourist trade supports this kind of venture easily there. giles, you forgot to mention that jamaica is also way ahead in the freely-available-guns, violent death, familial breakdown and armed robbery stakes - and even despite Naija's greater population! Plucky wee JA takes them all on... you people are really trying-o. I've wondered about the same sort of thing.. What if you set up a "brewpub" in VI or another area with lots of expats? The money coming in from the restaurant/bar can help cover some of the brew equipment startup costs. I've heard Nigerians and Jamaicans in England argue this out, and to be honest it serves no purpose. When Nigerians were losing ground they resorted to getting abusive. rank Jamaica as ranking 101, tagged under "Medium human development" and Nigeria is down in position 158 under "Low Human development" out of 177 countries. A tongue in cheek quip to Jeremy's question is athletes. Despite having an area not much bigger than Lagos state and a population many times smaller, they consistently out-perform Nigeria in sports, and they have a lot less money to spend. Maybe its a case of quality over quantity. If you can get both operating then you've hit the jackpot!